These regulators were designed to meet the needs of applications requiring reliable lowpressure control of non-high purity gases. They are available in single and two stage versions to meet most non-corrosive gas applications. The low pressure stage has a large sensitive neoprene diaphragm to provide delivery pressures as low as 2" of water. Large sensitive diaphragm for reliable pressure control. Maximum inlet pressure 250 psig. Needle valve on outlet is standard. 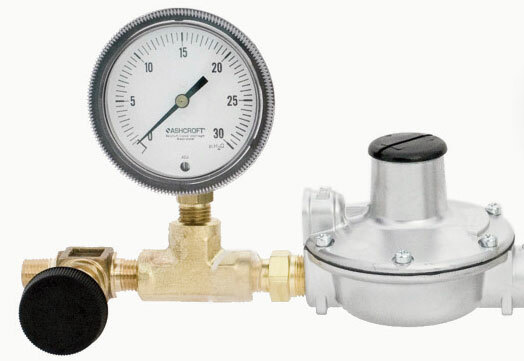 The Series 3700 regulators are available in three delivery pressure ranges; 2-35" of water, and 0.8-2.7 psig and 2.7-5 psig. As a line regulator they have a maximum inlet pressure rating of 250 psig. The inlet and outlet connections of the regulator are 1/4" NPT female, but with the standard needle valve installed the outlet connection is 1/4" NPT male. If you do not desire the outlet valve add suffix "NV" to the part number. When source gas pressures exceed 250 psig, this hybrid regulator created by coupling a Series 3700 regulator with a Series 2401 single stage regulator is an ideal choice for such higher pressure applications. First Stage See model 2401 on page 20. *Specify CGA connection when ordering. If you do not desire the standard outlet valve add the suffix "NV" to the part number.